Going Light and Bright in the Master! I shared the difference that new color made on that wall above here. That was six months ago. :) I really do like the old gray green color but it had been 11 years since I put that up and it was time for a different look. 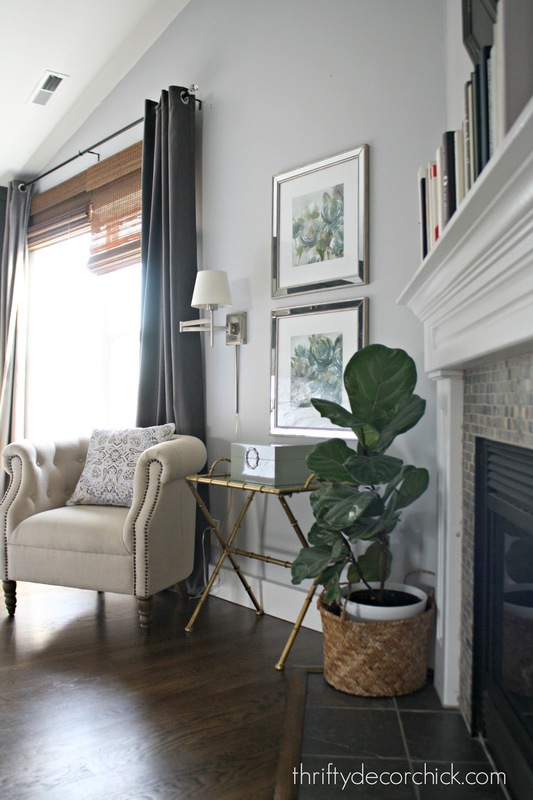 The new light color has completely changed the feel in this room! There's a little wall next to the fireplace that I have changed out numerous times over the years. I've never felt like it was quite right. This little spot is where I sit and put my makeup on so it needs to be comfy -- that settee was OK but was way too big for that spot. The cats tore it up too. I knew the paint was going to get lightened up eventually (just didn't plan on it taking me this long). Last summer I found a new chair instead of the settee and it made a BIG difference. I saw a much lighter space coming together and I loved it. I absolutely LOVE the colors. The mirrored frames are so pretty too. I'm considering looking for one more of these framed prints to make this even taller, but I'm not sure I'd love it. The fireplace wall is getting some simple trim work and that will come after this no spend month is over. I cropped out the wall to the right that is still the dark green color. ;) It's the biggest wall and I hope to start tackling that one today. I want this painting done! I can't stress enough the difference a can of paint can make! 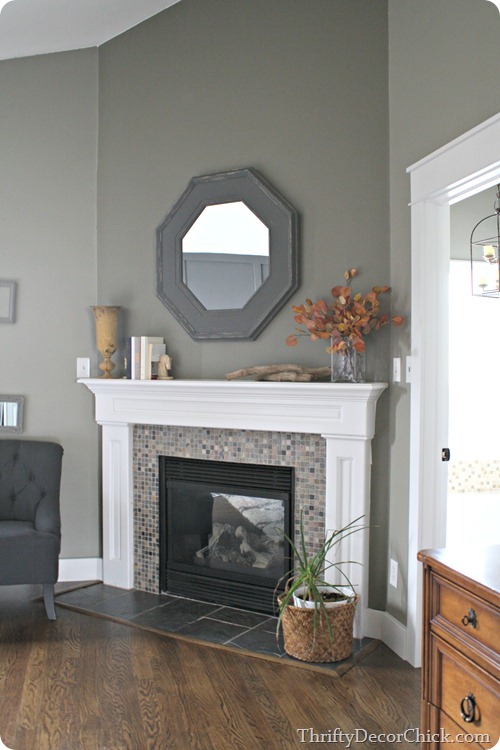 This is called Whitestone -- it's a Benjamin Moore color but I have it mixed in Sherwin Williams. One gallon did two coats each on this wall, the fireplace wall and the wall I showed you on the other side of the room. Awesome! I love when it finally comes together! Lots of changes still to come, stay tuned! I'm off to finish up this paint! I have a question about your floors. My house is about 15 years old or so, and still has original carpeting and those terrible vinyl sheet floors in the kitchen and bathrooms. I want to do all laminate wood-like floors because real wood is too expensive for us, but my husband isn't convinced he would like hard flooring everywhere. He says he would hate it in the bedroom, but I refuse to put carpet back in. Do you ever feel like the wood is too hard for bedrooms or rooms you might spend time on the floor in? I'm not an expert - and also not the person that wrote this blog, so probably not who you were looking to for comments, but I do get where both of you are coming from! Hard floors are just so much CLEANER! But there is a coziness about carpet. I think I prefer carpet in my living room/family room because that's where a lot of lounging happens, and it feels cozier. 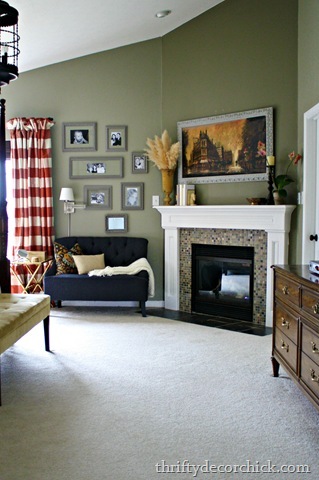 I might sit on the floor with my husband or daughter near me on the couch, and a carpeted floor would be nicer for that. But bedroom, I'm all about hardwood with area rugs! We moved a year ago and all of our bedrooms were carpet in our former house. We are completely hardwood in our new house and I don't miss the carpet at all. Hardwood is cleaner and prettier. My husband was a skeptic until we moved. We are slowly purchasing area rugs and that is an option. I would research your laminate quite a bit. We went with a higher end DuPont laminate on our main level of our townhouse and it really did not hold up as well as we liked. Watch dragging any plastic storage container around on laminate. There are different options out there. Hello Jessica! I'm sorry it took me so long, I couldn't get my reply button to work. :/ I was a little worried about how it would feel underfoot, but it just takes getting used to. Now I don't notice it at all, even in the middle of the night. I do have a big rug under the bed so that's a soft spot for our feet to land when we get out of bed. I would definitely recommend that. Overall I love having the wood floors in here -- it's great especially if someone has allergy issues. I love the way your home keeps on evolving. Your bedroom looks so fresh, bright and inviting. You give me so much inspiration, thank you for that. Do you EVER sit down? I know I can be a bit hyperactive, but you put me to shame with your energy level. Keep up the amazing work. I love your blog. Ha! Well it helps that I need projects to blog about -- I think very often to myself that I wouldn't get nearly as much done if I didn't write this blog! :) I do sit, somedays I'm crazy productive and others I barely get a thing done (like over the holidays). It looks so much better..fresh...beautiful! Love it! Very serene and love all the 'layers' you have going on with (metals, plants, textiles etc). Looks great! Looks great!!! Instead of a third frame what if you move the bottom one up a little higher and then space the top one a little higher to fill the space? I thought about that, I may do it! I'm holding off for a bit because I just filled a million holes in that wall and can't bear to do it again if I move them. Ha! I, for one, LOVE that you share your "before before". There was a dark time in our nation's history in which we all wanted the interior of our house to look like a Starbucks. I was reminded of this myself last weekend, when while cleaning a closet, that I unearthed some home decor items I would be embarrassed to put on Craigslist for free. Ah, well. 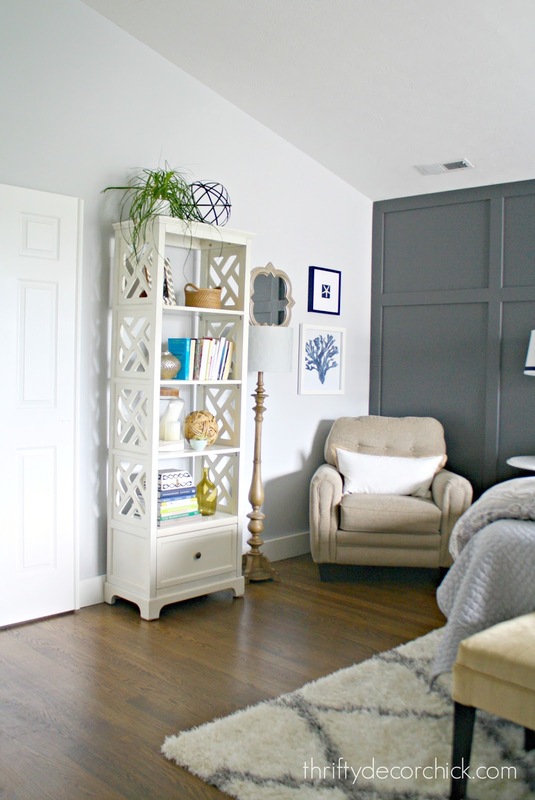 Our Master Room is the same color palette as yours so this definitely gives me inspiration as we set up our room. Since we recently moved into our new home I'm excited to decorate the house and you're blog always gives me such inspiration! Thank you! Looks so comfy! I LOVE the prints, and think a 3rd would be beautiful for those tall ceilings! This looks so cozy!. Going by the angle of the pic, I have to say that I don't think a 3rd print is necessary. There is a nice flow from the low-backed chair, to the sconce, then up to the prints. 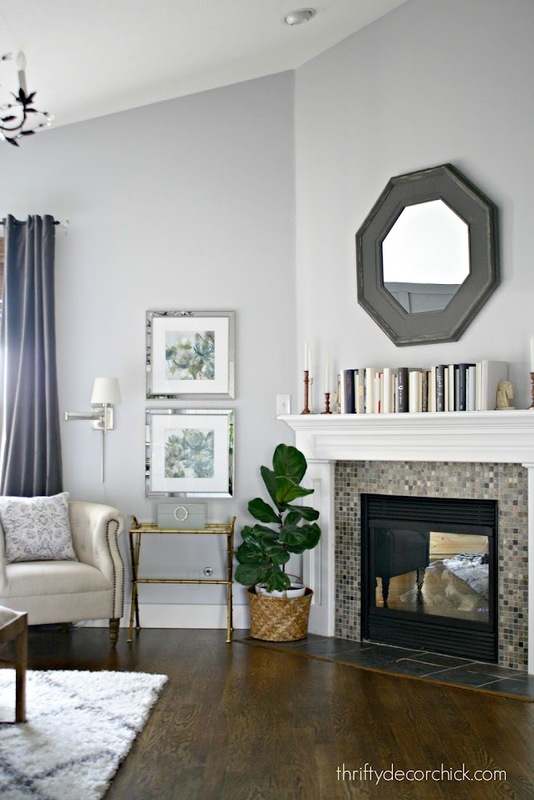 Also there isn't any competition with the mirror over the fireplace with just the two prints where there might be with three. It looks so much better and it looked great before. I have the same short wall next to my fireplace in the living room and it took a minute to figure out what to do, which is pretty much exactly what you did. Love the mirrored frames, too. When you say you've had the old pictures up there for years part of me is thinking, but I remember before they were there. That much time has not passed, right? Confession: I'm still crushing on those buffalo check curtains from way back. Love how this is coming together. Obsessing over the books on the mantle. Love that! Your home is absolutely beautiful! Totally loving the wall color! 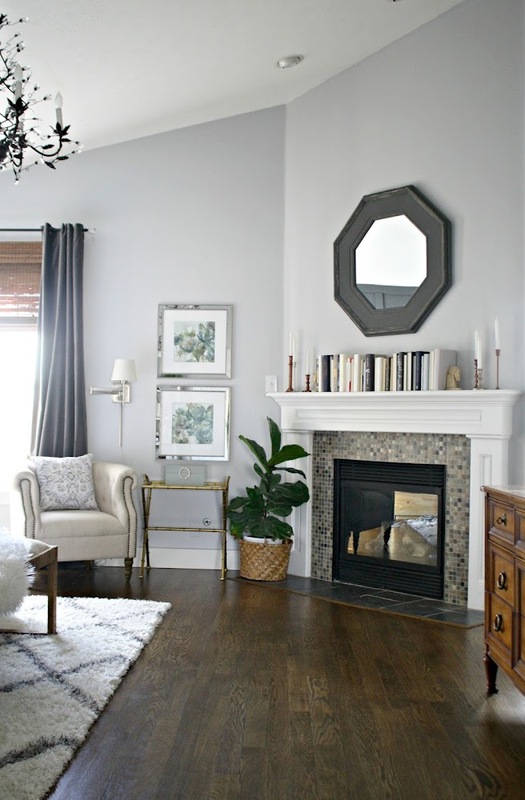 I am repainting my living room and this color is in the running! 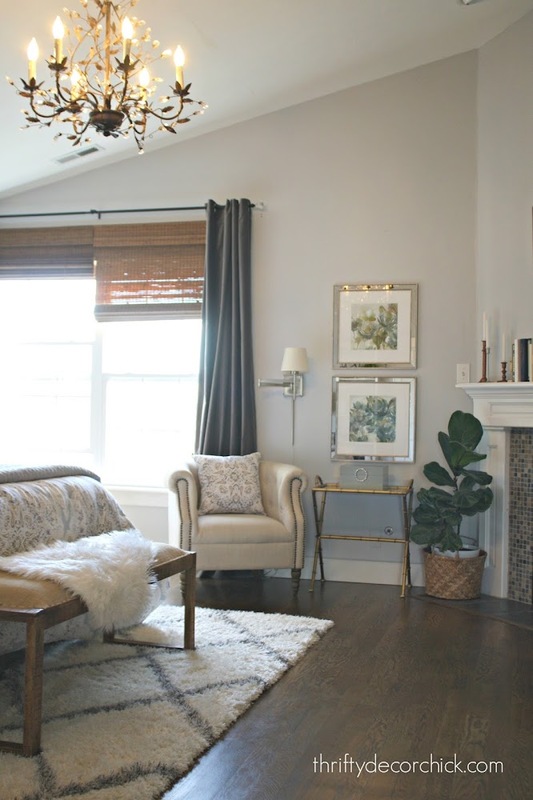 I love love love that you have a fireplace in your bedroom! And agreed, the light color really made it feel like a grown up retreat! I think it's so much brighter and lighter! 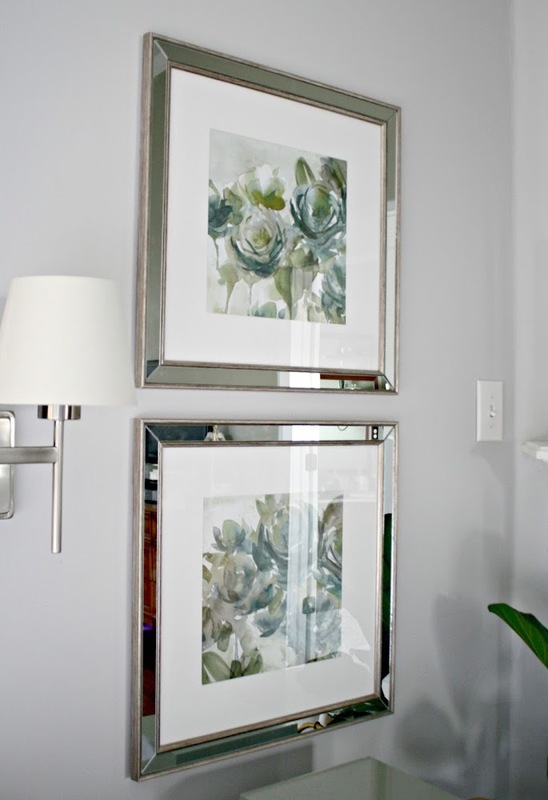 Love the prints and mirror frames as well. I agree on hiring out someone to tackle that last wall. Just not worth your anxiety or risk of injury! Always looking forward to Mon-Wed-Fri for my TDC fix! Gorgeous! 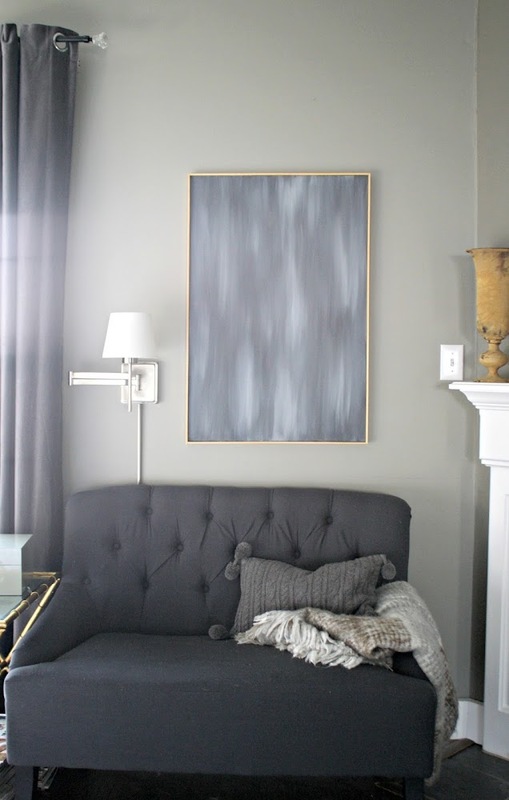 I painted most of my interior walls grey last year. I love it. 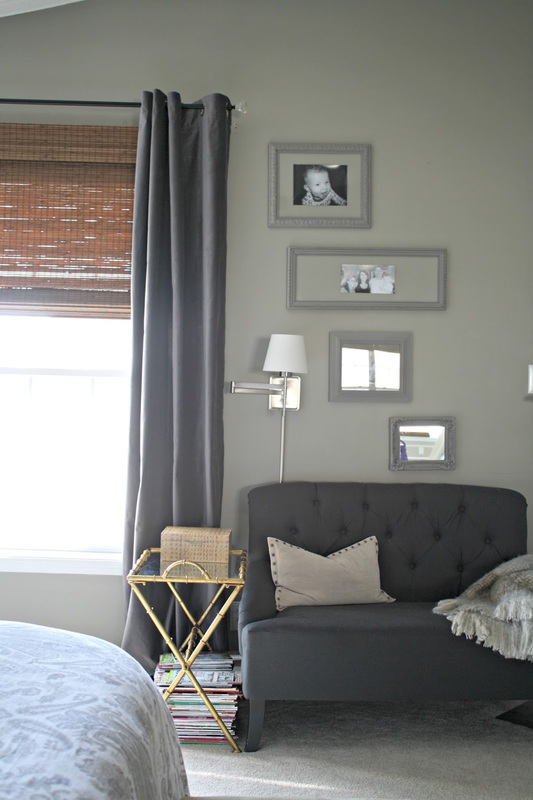 Grey is the perfect neutral -- it goes with everything! White and grey combination really looks very classy. Mirror frames are very beautiful. This looks beautiful! I love the row of books on the fireplace, too. I'm totally stealing that for our living room until we get around to bookcases. Stunning, what a difference!! Question about getting SW paint in BM colors. Does SW already have the formulas for BM? Do you just go in with the BM color number and they just whip it up? Sounds too good to be true!! SW is my favorite brand (love their 40% off sales) but BM seems to have so many more colors I'm drawn to, but I won't pay BM prices. This is the first blog I ever subscribed to and it is still my very favorite, you are a great talent, you should be so very proud! Wow, what a difference!! And I am loving the new artwork! !